One knows when results of Senate investigations are in blatant aid of publicity to portray persons as immediately guilty, propped up by “evidence” that is not evidence at all. A prime example of such a publicity stunt was displayed by the Guingona-led Senate blue ribbon committee report on the used helicopter issue, where the chairman, TG Guingona, pointed out that it was former First Gentleman Mike Arroyo was the true owner of the used choppers sold as brand new to the Philippine National Police (PNP), apart from naming more officials of the previous administration and other police officers linked to the sale of the choppers. Guingona made a big show of saying that the Senate will be filing a complaint before the Ombudsman, when in fact what he did was merely to turn over the report to Conchita Carpio-Morales for further preliminary investigation. Finally, the gloves are off, with the Supreme Court Chief Justice telling it like it is — at least on the manner by which the Aquino Palace and its rubber stamp Congress have been trying to control the high court into subservience to the executive power. It really was time for the chief magistrate to shed off his Mr. Nice Guy personality, especially since it just wasn’t he, but the entire judiciary that Noynoy and his Palace boys were, even before he assumed the presidency, wanted destroyed by doing his bidding. MANILA — Farmer Juanito Ramiscal could not believe what he saw as soon as the flood subsided in the far-flung subvillage of Bertece in Guimba, Nueva Ecija. All the fruits of his hard work were washed away by typhoon Quiel, the last of the two consecutive typhoons that recently hit the country. Ramiscal sat down and lost consciousness. His family brought him to the nearest hospital and was consequently announced dead on arrival. He died of a stroke on September 30. He was 58. When Bayanihan Alay sa Sambayan (Balsa), a relief operation spearheaded by progressive group Bayan, arrived in their community, they brought them goods that could somehow ease their impoverished conditions for the next few days. Ramiscal’s name was called but it was his children who claimed it on his behalf. The town of Guimba is one of the most affected areas in Nueva Ecija, the country’s rice granary. 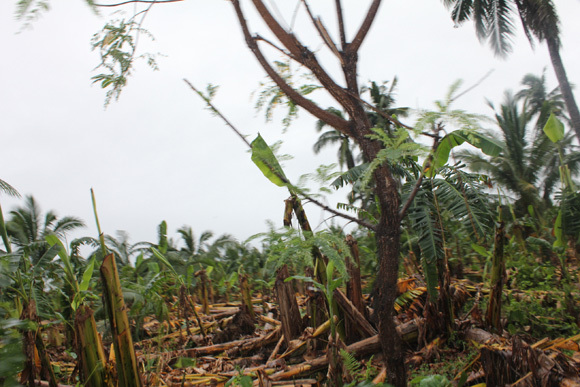 Local peasant organizations estimates that about 70 percent of their crops were destroyed by the two typhoons that hit the country. Despite their conditions, residents said they hardly received sustainable assistance from the local government and none from the national government. In his message before the residents, Bayan secretary general Renato Reyes Jr. said their efforts are in response to the inaction of the government to look into the needs of the Filipino people who were affected by the typhoons and consequently the release of water from nearby dams. “But I urge everyone that we should not be satisfied with our humble relief goods. 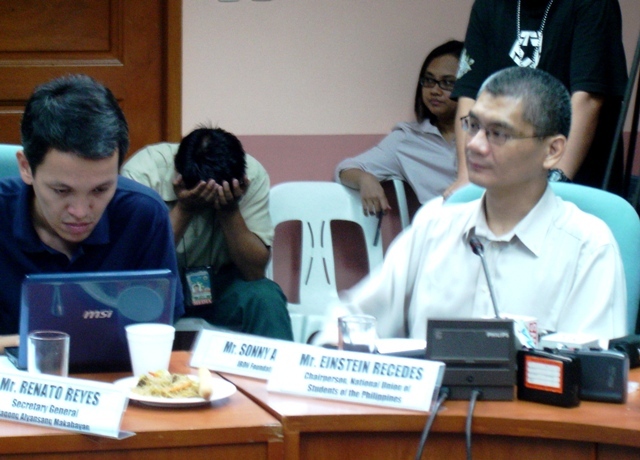 It is the government’s responsibility to address our concerns,” Reyes said. The Department of Agriculture estimates that the agriculture sector lost about $277.4 million, of this, the loss in palay or rice produce amounted to $254.3 million or 760,207 metric tons. The Apeco, composed of residential, commercial, industrial, eco-tourism, highways, ports and airport projects, was created with the passage of Republic Act No. 9490 entitled “An Act Establishing the Aurora Special Economic Zone in the Province of Aurora, Creating for the Purpose the Aurora Special Economic Zone Authority, Appropriating Funds Therefor and for Other Purposes” (otherwise known as the ASEZA Act of 2007) and its amendatory law, Republic Act No. 10083 entitled “An Act Amending RA 9490 Otherwise Known as the Aurora Special Economic Zone Act of 2007” (or the Aurora Pacific Economic Zone and Freeport Act of 2010). The petitioners, composed of farmers, fishermen, indigenous peoples from Casiguran, Aurora and organizations such as the Alyansa ng Magbubukid sa Gitnang Luzon (AMGL), Panlalawigang Alyansang ng Magbubukid ng Aurora (Pamana) and Justice and Peace Action Group of Aurora (JPAG), Kilusang Magbubukid ng Pilipinas and Pambansang Lakas ng Mamamalakaya (Pamalakaya), among others, are asking the Supreme Court to strike down and declare as unconstitutional the two laws. They are all part of the Resist Apeco! Defend Aurora Movement. “The petitioners who belong to the poor and oppressed sectors of the society – the farmers, fisherfolks and indigenous peoples, are presently in great danger of losing their properties, their livelihood and what little they still have to be able to exist and survive, in clear violation of the rights and protection mandated to them by the Constitution,” the petition read, a copy of which was sent to Bulatlat.com by the Public Interest Law Center (PILC), counsel for the petitioners. The petitioners asked the court to issue a temporary restraining order and/or writ of preliminary injunction ordering the respondents to cease and desist from proceeding with the implementation of the Apeco. 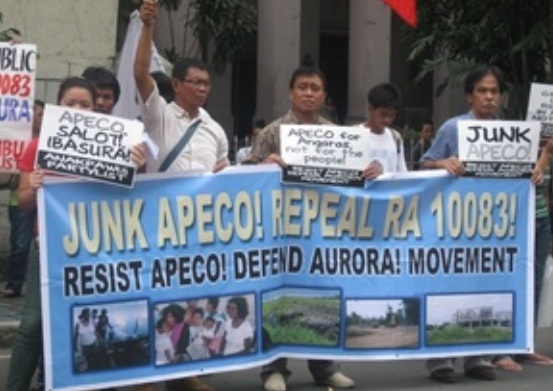 Named respondents are Apeco as represented by its board composed of Roberto K. Mathay, Aurora Gov. Bella Angara-Castillo, Rep. Juan Edgardo “Sonny” Angara, Mayor Victorio Briones of Dilasag, Aurora and Harley Rose Alcantara Daquioag, House Speaker Feliciano Belmonte and Senate President Juan Ponce Enrile for Philippine Congress for enacting Aseza and Apeco laws. The groups said that in implementing the Aseza-Apeco laws, the respondents are depriving the residents of Casiguran, Aurora of their homes, ancestral domain, land and livelihood. The petitioners asserted that both laws violate the social justice provision on agrarian reform stated in the 1987 Philippine Constitution. 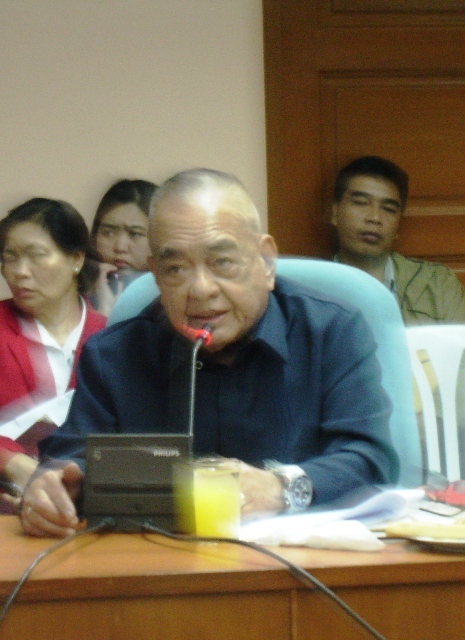 In one of the hearings at the House of Representatives, Undersecretary Gerundio G. Madueño of the Department of Agrarian Reform (DAR) said 525 hectares of land have been distributed to about 425 agrarian reform beneficiaries in the areas covered by the Apeco. MANILA – Eighty-two of the Philippines’ 130 constitutional provisions still have no enabling law; for the economic provisions in particular, at least eight articles still have no enabling law up to now, said Philippine Constitutional Association’s Manolo Gorospe during this week’s hearing in congress on charter change or cha-cha. The economic provisions that have no enabling law, he told bulatlat.com, include Articles 2 to 4, 8, 14, 16, 20 and 22. The laws that have been passed serve only to push to maximum levels the further and wider liberalization of some sectors of the economy, said Sonny Africa, head of the research department of non-government think-tank Ibon Foundation at the public hearing. The nationalist economic provisions of the Philippine Constitution have not been implemented, he said, adding that this helps to explain why unemployment is at its worst today, as do the country’s persistently stunted agriculture and manufacturing. “Since Congress has failed to pass enabling laws, or since many provisions of the Constitution have not been implemented, what are you going to amend now?” asked Gorospe. The House of Representatives has been holding public hearings on its Concurrent Resolution 10, which calls for Congress to constitute itself into a constituent assembly to propose amendments to economic provisions of the 1987 Constitution. A similar effort is afoot in the Senate although the House is still awaiting the Senate draft. “As presented to the committee by resource persons from various sectors, the idea behind the move for constitutional amendment is to remove the restrictions in the economic provisions to the entry and participation of foreign investors, so the country’s economy can be flexible,” said the chairman of the House Committee on Constitutional Amendments Rep. Loreto S. Ocampos at the end of this week’s hearing. Resource speakers who attended the public hearing asked Congress to maintain instead the “good policies” written in the present Constitution. The 1987 Constitution is “a moment of wisdom” for the Filipino framers of the Constitution, said Sonny Africa during the hearing. He reminded the members of the House Committee on Constitutional Amendments that historically, not one country has developed without maintaining economic restrictions or protection. Citing figures and data in a presentation, he also showed that globally in the past ten years, the trend among countries is to put in restrictions and protection into their domestic economic policies. Africa observed that this is also true even among those who are pushing the Philippines to remove restrictions against foreign capital. Based on the experiences of other countries including its neighbors whose economic policies are less liberalized or more protected than in the Philippines, Africa said, “The potential gains from foreign investments did not just happen without strong government regulations.” Without being anti-foreign investments per se, he pointed to the examples of some governments who pushed for technology sharing while others required their foreign investors to source raw or intermediate materials from the host country, to increase its economic gains from foreign investments. TRENTO, Agusan Del Sur — Her voice rising above the soft hum of radio songs, Amelia Dano could not hide her restlessness. Sitting at the front of a four-wheel drive vehicle, Amelia waited in trepidation as the ten vehicle convoy finally crossed Monkayo town, the last municipality in Compostela Valley province. One fine Sunday morning, the fleet of families, media and peace advocates entered the province of Agusan del Sur, through the rough road traversing the palm oil plantation and roads littered with logging workers. At the first stop, Amelia reached for her make-up, looked at the mirror and retouched a faintly gaunt face, borne out of weeks of sleepless nights. Soon, her husband, Henry Dano, mayor of Lingig town, Surigao del Sur will be released by the New People’s Army (NPA). For these three women, second chance is at hand. Hours later, a visibly happy Mayor Dano, wearing a white camisa de chino, a pair of black jogging pants and slippers, said of the day of his release, October 9 as another birthday celebration. He celebrated his birthday at the forests with the NPA last September 6. Staunch Reproductive Health (RH) bill critic Sen. Vicente Sotto III has opposed the sug-gestion of Sen. Pia Cayetano to end the interpellation on the contro-versial RH measure and instead proceed to the period of amendments when the upper chamber resumes consideration of the Senate Bill 2865. Sotto also belied allegations that senators were no longer interested to interpellate the bill’s sponsors. “She is wrong. Many interpellations are still lined up,” he stressed. The oil spill incident in New Zealand waters involving a Filipino captain has stirred negative sentiments against Filipinos in the city of Tauranga, but the Philippine Embassy said these are only “few” and do not reflect the general feeling of all residents there. A Filipino captain of a container vessel that leaked oil in Tauranga is facing charges for causing environmental disaster, angering locals. He is currently out on bail but he will remain in New Zealand until after all court hearings are over. The bail expires on Oct. 19. Malacañang nudging exile for Arroyo couple? It appeared to be a Freudian slip but presidential spokesman Edwin Lacierda gave former President Gloria Arroyo a veiled message to choose whether or not to return to the country from medical treatment abroad, saying the now Pampanga representative has the option whether or not to return home. Lacierda told reporters the administration is not worried at all if Arroyo would decide to stay overseas even if the government would start filing charges against her by November. “That is something for her to decide. We will do what is incumbent on us to do; we will do what we have set out to do. As to what her course of action, again, that is for her to answer and not us,” said Lacierda when asked what would Malacañang do in case Mrs. Arroyo seeks foreign asylum and decides not to come back to face the charges that will be filed against her. The Philippine government should rescind its plan of deploying civilian militias to augment security at private mining operations, Amnesty International said. President Aquino approved the military’s proposal on Oct. 12 after forces from insurgent group New People’s Army (NPA) attacked mining operations at Surigao del Norte province in northern Mindanao, killing three private security guards. Amnesty International said that such militias, including the Citizens’ Armed Forces Geographical Units (Cafgus), have a long record of human rights violations in the Philippines. According to the Commission on Human Rights of the Philippines, Cafgus have been responsible for arbitrary detention, torture, and killings of local community leaders. “The aborted three-day official visit of Slovakia’s President Ivan Gasparovic yesterday to Manila sent a strong signal to the grim economic situation in Europe that should compel cautious monitoring by the country’s economic managers, as the economic troubles in Europe would eventually have dire financial consequences to governments around the world, including the Philippines,” Sen. Aquilino “Koko” Pimentel III said yesterday. “This should compel our government’s economic managers to closely monitor the economic developments in the European Union so that whatever impact it may have around the world, the Philippines will not be caught by surprise,” Pimentel said. “Countries around the world do not live in isolation. What is happening in the European Union will ultimately impact the financial conditions of countries around the world, including the Philippines,” he added. Retarding basins will be built in low-lying areas of Metro Manila, including España Boulevard, as part of national government’s approach to flooding problem that has cost billions of pesos annually. At a media briefing yesterday, Department of Public Works and Highways (DPWH) Secretary Rogelio Singson said he had high hopes on the construction of water retarding or detention basins as a most viable solution to reduce downstream flooding during rainy season. Vice President Jejomar Binay yesterday condemned the killing of the vice president for administration of the Polytechnic University of the Philippines (PUP), saying it added to the tension at PUP caused by leadership row.